In the introduction to last week’s Bubble Watch, we briefly discussed how the lack of small conference teams with at-large worthy résumés, coupled with down years for conferences like the American and Atlantic 10, will help power conference teams thrive on the bubble this season. This issue isn’t limited to small conferences, however. Both the SEC and Pac-12 could struggle to put more than four teams in the field. Even the Big East, with a powerhouse like Villanova and other tournament locks such as Creighton and Butler, could top out at five bids. In turn, the ACC, Big 12 and Big Ten could very well gobble up nearly 30 bids, or close to half the field. The attrition of conference play could ultimately preclude that from happening, but, for now, those three conferences sending close to 30 teams to the Big Dance is well within the realm of possibility. SMU (20–4, 10–1) has thoroughly dominated its conference opponents not named Cincinnati, putting itself comfortably alongside the Bearcats at the top of the AAC, that we’re taking them out of the Bubble Watch. It would be silly to expect the sort of downturn from the Mustangs that would have them on the bubble on Selection Sunday. They join the Bearcats safely in the field of 68, and there’s a chance they’ll be the only two AAC teams to go dancing. Houston (16–7, 7–4) is ranked 43rd on kenpom.com and 60th in RPI, so its unlikely it will get into the field on the strength of its metrics. The Cougars likely have the next best chance in the conference, but when your best wins are against Rhode Island and Vermont, losses to Harvard and LSU stand out even more than they normally would. Houston’s path to an at-large bid includes no more losses to the AAC’s also-rans, one win in its remaining games with SMU and Cincinnati, and a deep run in the conference tournament. That wouldn’t guarantee an invite, but it’s the only possible formula for the Cougars to get in without winning the AAC tournament. Memphis (17–7, 7–4) and UCF (15–8, 6–5) are in a slightly weaker position than the Cougars, and again, the cougars are not in a strong spot. They’ll each need to follow the same path prescribed for Houston to get an at-large bid to the dance. Houston got the focus of this section because they’re the best equipped of the three turn that small chance into a reality, but it’s far more likely that we see all three of these teams in the NIT, CBI or CIT. UCF has the biggest week ahead with a trip to Cincinnati slated for Wednesday. Dayton (17–5, 8–2) and VCU (18–5, 8–2) still do not have the résumés to be considered locks for the NCAA tournament, but both are heading in that direction. The Flyers took care of business last week, knocking off Fordham and Duquesne. They’re going to go into Selection Sunday without a signature victory no matter what they do the rest of the season, but if they play to script, they’ll also have about 25 wins and a 14–4 or 15–3 conference record. That’ll certainly get them an invite, even if their ceiling is a No. 7 seed. The same goes for VCU, which averted a mini-disaster by pulling out an overtime win at St. Bonaventure on Saturday. The Rams will meet again in Dayton the final week of the regular season, and it’s entirely possible that neither will lose before then. If that’s the case, the second matchup won’t matter in terms of them making the field of 68. Rhode Island (15–7, 7–3) was one of our Next Four Out teams in this week’s Bracket Watch, a judgment which, with a couple more days of reflection, seems a bit harsh. The Rams will be able to point to their neutral-floor win over Cincinnati as evidence that they can beat top-flight tournament competition, and that win looks better with each passing week. The problem, though, is that even just a few slip-ups in a conference like the A-10 can be costly. Rhode Island has losses to La Salle and Richmond to counter, as well as a nonconference reversal at Valparaiso. None of those is terrible. Valparaiso is the best team in the Horizon League, and Richmond has itself on the bubble thanks to its strong play in the A-10, but that doesn’t change the fact that the Rams have dropped five games to teams unlikely to earn at-large bids. A win over Cincinnati, strong as it may be, cannot counter that on its own. Rhode Island needs another résumé-builder or two to get into the Dance. Their next opportunity comes on Friday with Dayton in town. Finally, Richmond (14–9, 8–3) kept itself on the fringes of the bubble discussion after losing to VCU and beating George Washington last week. The Spiders have done enough to warrant at least a mention in the Bubble Watch. At the same time, they’re 0–2 against Dayton and VCU, and have losses to Old Dominion, Bucknell, Oral Roberts and George Mason. They aren’t getting close to an at-large bid at this rate and are done with Dayton for the regular season. Their path to an at-large includes a win over VCU next week and a deep A-10 tournament run, likely with at least one win against the conference’s top two teams. Syracuse (15–9, 7–4) gets first mention this week after surging into the backend of the field of 68 in our Bracket Watch. The Orange started the week by erasing a 14-point deficit in the final 10 minutes at NC State, winning 100–93 in overtime. They followed that up with possibly their biggest win of the season, a 66–62 home triumph over Virginia. They’ve won four straight games, including against Florida State, and have a respectable record in one of the two best conferences in the country. Getting to 10 wins in the ACC will do wonders for any team’s at-large candidacy, and the Orange need to go just 3–4 the rest of the way to do so. Every bubble team has its flaws, and the Orange can’t simply dismiss losses to Connecticut, St. John’s and Boston College. Still, few bubble teams have proved themselves capable of beating teams the caliber of Florida State and Virginia. Those are the brand of victory that can counterbalance a few bad losses. The Orange are on the right trajectory with five weeks until Selection Sunday. With seven games left in the regular season, Wake Forest (14–9, 5–6) is in an interesting spot. The Demon Deacons rank 33rd on kenpom.com and 28th in the RPI. 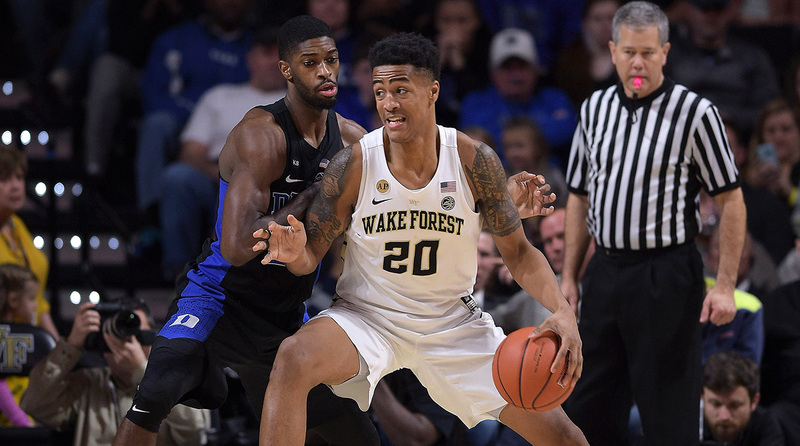 Althoug the committee’s stated interest in more advanced analytics could help the Deacs, Wake still has to overcome its 0–6 record against the RPI top 25 and 0–8 record against the top 50. All nine of their losses are to teams in our field of 68, but their best win to date came at home against Miami. As it stands, Wake Forest presents the committee with one of its toughest calls. The good news, for both the team and the committee, is that there are five more weeks for at-large résumés to strengthen or weaken. The Demon Deacons have three games left in the regular season against teams locked into the tournament, starting at Notre Dame on Tuesday. If they can get just one of those games without suffering any bad losses, it’s likely they’ll be a happy bunch on Selection Sunday. Georgia Tech (13–10, 5–6) is shaping up to be another wildly interesting team for the committee. We have them in the field as a No. 11 seed in this week’s Bracket Watch, but that was admittedly an at-large bid given without a ton of confidence. Whether you think the Yellow Jackets presently belong will depend heavily on what you consider most important trait in a bubble team. If you love the metrics, you’re probably cool on the Yellow Jackets, which are 78th on kenpom.com and 75th in the RPI. If you measure a team by the quality of its wins, however, you’re fully supporting their inclusion in the field of 68. The Yellow Jackets have beateb=n North Carolina, Notre Dame and Florida State this season. They’re basically the opposite of Wake Forest. The good news for both is that there isn’t one right path to an at-large bid. But Georgia Tech doesn’t have a ton of wiggle room and will likely need to finish 9–9 in the conference and avoid any embarrassing losses the rest of the way. Miami (15–7, 5–5) and Virginia Tech (16–6, 5–5) experienced little movement in their respective at-large hopes last week. Both teams played to script, with the Hurricanes losing to Florida State and winning at NC State, and the Hokies falling at Virginia in their lone game. Both were already in our field of 68, and that didn’t change because of last week’s results. They play each other in Miami on Wednesday, before moving on to big challenges over the weekend. Miami visits Louisville on Saturday, and Virginia Tech gets a return matchup with Virginia in Blacksburg on Sunday. We’ll wrap up the ACC with Clemson (13–9, 3–7), which may have taken a net negative week, despite a win over Georgia Tech. The Tigers visited Florida State on Sunday, a game they were absolutely expected to lose. No one faults them for dropping a road game with one of the best teams in the conference, and a No. 2 seed in this week’s Bracket Watch. The problem, though, was how they lost. Clemson gave up 109 points to Florida State en route to a 48-point shellacking. That sort of loss could weigh heavily on Clemson’s at-large hopes, especially since they’re just 1–4 against the RPI top 25. Still, with a 4–6 record against the top 50 and eight top-100 wins, the Tigers are worthy, just barely, of a spot in the field of 68 this week. They, too, have a monster week ahead, with games against Syracuse at home and Duke on the road. The matchup with the Blue Devils represents one of their final two chances in the regular season to get a win against one of the ACC’s six tournament locks. After losing to Syracuse and Miami at home last week, NC State (14–10, 3–8) is no longer on our at-large radar. What a week to be a bubble team in the Big 12. Three of the conference’s teams got what could be silver-bullet victories over the weekend. We won’t have that perspective for a few more weeks, but Iowa State (14–8, 6–4), Oklahoma State (15–8, 4–6) and Kansas State (16–8, 5–6) should all feel pretty good about where they stand. We’ll take them in that order, which also is where they sit in relation to one another on our s-curve. The Cyclones were in good shape before their huge comeback win at Kansas. Any team with a win at Allen Fieldhouse this season (so far, that’s just Iowa State . . . and Kansas) should be all but locked into the field of 68. It’d still be a bit premature to call the Cyclones a lock, but it would likely take a disaster for them to come up short. They need to keep it clean against Texas and Oklahoma, the Big 12’s bottom feeders, this week. Next up are the Cowboys, which have won five straight games, punctuated by a road win at West Virginia. They may be just 4–6 in conference, but three of those wins are against teams either locked into the field or firmly in the bubble discussion. Add in victories over Arkansas and Wichita State, and it’s easy to see why the Cowboys earned a No. 8 seed in this week’s Bracket Watch. The Cowboys remain second in kenpom.com’s adjusted offensive efficiency, and that style has them well suited to get another big win in the conference before Selection Sunday arrives. They host Baylor and Texas this week. A win over the Bears, which they nearly pulled off in Waco last month, would essentially guarantee their at-large bid. With their win at Baylor over the weekend, the Wildcats became the second team in conference with wins over two of the conference’s three elite teams. The other is West Virginia, so that should tell you just how impressive the Wildcats’ résumé is. The Wildcats put up a good effort against Kansas on Monday, but they didn’t have enough to pull off their second straight upset. They have another tough test ahead with a trip to West Virginia on tap this Saturday. The third tier in the Big 12 includes a couple of teams from Texas knocking on the door of the tournament. TCU (16–7, 5–5) is one of our First Four teams out in this week’s Bracket Watch. The Horned Frogs tipped Kansas State on the road in overtime last week before cruising to a win against Texas over the weekend. They’re 32nd on kenpom.com, 43rd in the RPI and on the right trajectory to get into the Dance. We could have easily had them in the field this week at the expense of a team like Clemson, California or Tennessee. The reason they’re just on the outside for the time being is that they’re 0–4 against tournament locks, 0–3 against the RPI top 25, and 4–7 against the top 100. The wins over Kansas State and Iowa State are nice, but the Horned Frogs are going to need to take down one of the Big 12’s big three, or at the very least, come close to evening their record against the RPI top 100. They can take steps toward both of those goals this week with games against Texas Tech (16–7, 4–6) at home and Baylor on the road. The Red Raiders did serious damage to their at-large hopes last week with a loss at Texas. They bounced back to beat Oklahoma at home, but that doesn’t move the at-large needle in the slightest. They’re still trading on their win over West Virginia, but the résumé, as currently constructed, isn’t strong enough to get them an at-large bid. At 42nd on kenpom.com and 80th in RPI, the Red Raiders won’t be able to overpower the committee with metrics the way a bubble team like, say, Wake Forest, can. The Red Raiders are staring down a make-or-break six-game stretch that will likely determine which postseason tournament they play in. Their next six games are against TCU (away), Kansas (home), Baylor (home), West Virginia (away), Iowa State (home) and Oklahoma State (away). A 3–3 record is the absolute worst they can do to still be in at-large consideration heading into March. As Villanova continues to put distance between itself and the second tier in the Big East, let’s take a look at a team that solidified its status in that tier. 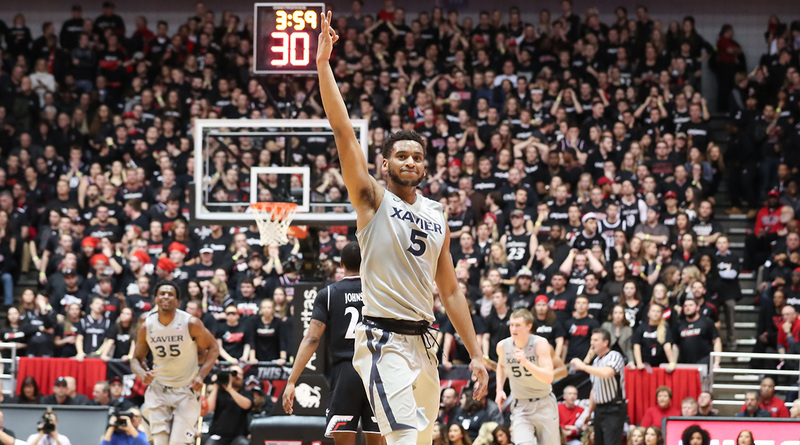 Xavier (17–8, 7–3) was reeling heading into February, losers of four of five games, all to teams that will be dancing. The Musketeers weren’t in any serious jeopardy of losing their at-large status, but they were certainly put in their place after losses to Villanova, Butler, Creighton and Cincinnati. Are they a tournament team? Absolutely. Are they a Final Four contender? Absolutely not. In that vein, Xavier’s win at Creighton last weekend was huge. Not only is it their best win of the season to date, it’s also just their second against a team in the Dance in this week’s Bracket Watch. The other was over a Clemson team that is teetering on the edge of the field. The win at Creighton has to give Chris Mack’s bunch confidence that they can not only get into the tournament, but play into its second weekend, as well. Marquette (15–8, 6–5) took another blow last week, losing by 14 points at St. John’s. The Golden Eagles did rebound against DePaul, but it was still a negative week. They remain on solid footing thanks to wins over Creighton and Villanova, but they should think of that St. John’s loss as their final mulligan. Another bad loss would leave their candidacy in question. They host Butler on Tuesday and visit Georgetown on Saturday. Seton Hall (14–8, 4–6) is one of our First Four Out this week, and even that could be a generous reading of where the Pirates stand. They have three solid wins over South Carolina, California and Marquette. They’re 52nd on kenpom.com, which is a ranking befitting a bubble team, and 37th in the RPI. That RPI number will help, but it isn’t a get-out-of-jail-free card. The Pirates are 0–4 against Villanova, Butler, Creighton and Xavier, losing once to each team thus far. They let a golden chance slip away at Xavier last week. The Pirates led for much of the game and never trailed by more than five points in the second half. Unfortunately, a Trevon Bluiett jumper with five seconds left broke a 70–70 tie and sent the Pirates home with a heartbreaking loss. The bet here is that they can’t secure an at-large bid without two wins against the top four teams in the conference. The good news for the Pirates is that they get three of the four of them at home over the second half of their Big East schedule. If they can go 2–2 in those four games and win their remaining four games with the bottom tier of the conference, they should hear their name called on Selection Sunday. Finally, we’ll throw a tiny bit of love at Georgetown (13–11, 4–7), which is still flickering on the at-large radar thanks to wins over Creighton and Butler at the end of January. The Hoyas likely need to go no worse than 5–2 in their seven remaining regular season games to have any at-large hopes. They visit Villanova and host Marquette this week. This week’s Bracket Watch features four Big Ten teams in the field of 68, in addition to the locks up above. Those four teams, however, are all in very different circumstances as the second week of February begins, and then there’s a fifth that fell out of the field, its very season hanging in the balance. We’ll start with the team in the best shape. Northwestern (18-5, 7­–3) saw its six-game winning streak come to an end last week but remains in solid position for the school’s first ever NCAA tournament appearance. The Wildcats are 30th on kenpom.com and 31st in the RPI, with wins over Wake Forest, Dayton and Indiana, and an 8–5 record against the RPI top 100. At the same time, they came up woefully short in their first test against the Big Ten’s elite, losing by 21 points at Purdue. They will get some slack from the committee, considering they were without leading scorer Scottie Lindsey (illness) as well as senior wing Nathan Taphorn (ankle), but it was still a telling game. A 21-point loss in a team’s biggest test of the year does say a thing or two, most notably that, despite all the positive press, the Wildcats shouldn’t yet be comfortable with their candidacy. With a trip to Madison looming this weekend, and a home date with Maryland three days after that, Northwestern must handle its business against Illinois on Tuesday. Given that six of their seven Big Ten wins are over teams unlikely to get at-large bids, they cannot afford many missteps. Michigan State (14–9, 6–4) played just once last week, earning a 72–61 win at Nebraska. Even though Nebraska isn’t on the at-large radar, it was an important win for a Spartans team that had lost three straight road games to the likes of Penn State, Ohio State and Indiana. While they’re headed in the right direction, it’s imperative for them to bank a few more wins against the weaker teams in the conference during the next 10 days with matchups against Purdue, Wisconsin and Maryland all looming in the last three weeks of the season. A trip to Ann Arbor on Tuesday is a crucial test. If they can win there then take care of Iowa And Ohio State at home, they’ll be in good standing with the committee heading into the home stretch of the regular season. Minnesota (16–7, 4–6) finally broke a five-game losing streak with a 68-59 win at Illinois last weekend. Despite the lull in the middle of their Big Ten schedule, the Golden Gophers are far more likely to be off the bubble for good reasons than bad come Selection Sunday. They’re 37th on kenpom.com and 23rd in the RPI, with an 8-7 record against the top 100 and a road win at Purdue. They still have trips to Maryland and Wisconsin, but they don’t need to win either of those games to get into the field. They have a relatively weak schedule the rest of the season, with games remaining against Iowa, Rutgers (both this week), Penn State and Nebraska, as well as mid-tier teams Indiana and Michigan, both of which are at home. If they can win five of those six games, which is not a lot to ask of an at-large quality team, it won’t matter what happens when they visit College Park or Madison. We still have Indiana (15–9, 5–6) in the field of 68, but the bet here is that the Hoosiers will play their way out of the field by Selection Sunday. At this stage of the season, it’s still too hard to ignore their wins over Kansas and North Carolina. Yes, they have lost a lot of games since then, and they aren’t the same team with OG Anunoby and James Blackmon injured. Still, those wins carry enough weight to keep them just barely inside the tournament picture. Unfortunately for the Hoosiers, they have a rough stretch to end their regular season. They still have two meetings ahead with the Boilermakers, with the first at home on Thursday. They also have individual games with Northwestern (home), Minnesota (away) and Michigan (home, this Sunday). Assuming two losses to Purdue, Indiana will likely need to go, at worst, 4–1 in their five other games still to play, and even then they might need to do some damage in the Big Ten tournament. At the least, they would have to avoid a bad loss. Remember, the committee does take into consideration a team’s current makeup. The Hoosiers will definitely be without Anunoby in March, and there is still no timetable for Blackmon’s return. The Hoosiers are 1-3 without both of them, with their only win at home in triple overtime against a middling Penn State team. Indiana isn’t the only Big Ten team in serious trouble. Michigan (14–9, 4–6) had a disastrous seven-day stretch recently. They lost to Michigan State on Jan. 29 and then dropped a home game with Ohio State last weekend. That knocked the Wolverines from the Last Four In in last week’s Bracket Watch all the way to the Next Four Out this week. The next two weeks could determine Michigan’s postseason fate. They play Michigan State (home) and Indiana (away) this week, and Wisconsin (home) and Minnesota (away) next week. Finally, Iowa (14–10, 6–5) and Ohio State (14–10, 4–7) are both showing up faintly on the at-large radar. The Hawkeyes have won three straight games and own a victory over Purdue. The Buckeyes, meanwhile, have knocked off Minnesota and Michigan State. Their road win at Michigan was their third of the year against a fellow Big Ten bubble team. There’s plenty more work to be done for both teams, with neither among even the Next Four Out in this week’s field of 68. Still, they’ve done enough to this point of the season to earn a mention in the Bubble Watch, and they could do wonders for their at-large hopes this week. Iowa spends the entire week on the road, visiting Minnesota and Michigan State. Ohio State, meanwhile, hosts Rutgers before a big trip to College Park to take on the Terrapins on Saturday. California (17–6, 8–3) took a huge step forward last week in the battle to be the next Pac-12 team in the field of 68. 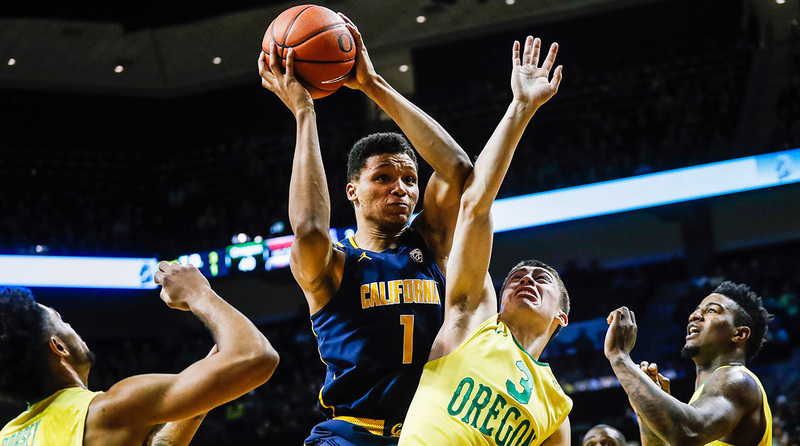 By beating Utah (15–8, 6–5) at home in double overtime, the Golden Bears drew first blood against the very team with which they could be competing for a trip to the Dance. While there may be room for both Cal and Utah in the field of 68, it’s more likely that their flaws, coupled with the relative weakness of the Pac-12 as a whole, will preclude both of them from getting an invite. As such, their head-to-head meetings carry great importance. Cal was supposed to win last week’s matchup, given that they were at home. The return date in Salt Lake City isn’t until the final week of the regular season, and it’s Cal that has the tougher schedule before then. The Golden Bears still have one game apiece left with Arizona and Oregon, beginning with the former in Tucson on Saturday. Utah is done with both Arizona and UCLA, but will visit Oregon next week. This week, however, the Utes have as easy a week as is possible in the Pac-12, with Washington and Washington State both making the trip to Salt Lake City. USC (20–4, 7–4) had a good week on the road, beating Washington by eight and Washington State by nine. The Trojans have won four straight games and have solidified their at-large bona fides. We’ll have a great sense of what type of tournament team they’ll be in the next two weeks. After hosting Oregon State on Thursday, the Trojans will face, in succession, Oregon, UCLA and Arizona, with the latter two games on the road. One win in those three should be enough to guarantee the Trojans’ inclusion in the field of 68. If they lose all three, they’ll likely need to win their other four remaining games in the regular season and avoid a bad loss in the Pac-12 tournament to feel safe on Selection Sunday. When your at-large candidacy is built with the total lack of bad losses and a strong RPI, just one unsightly blemish can bring everything crashing down. Such is life now for Arkansas (17–6, 6–4) after an 83–78 loss at Missouri last weekend. The Tigers are ranked 188th on kenpom.com and 236th in RPI. This was as a bad a loss as possible for the Razorbacks, a team that has just one top-50 win all season (incidentally, that’s the same number Missouri has). The Razorbacks still have road games left in the regular season with South Carolina and Florida. If they lose both of those games, they just may have to go 6–0 in their other remaining games to be in a strong position on Selection Sunday. The no-bad-losses argument no longer applies to the Razorbacks. It’s time to finally add a signature win, or they’ll be forced to overwhelm the committee with wins. We have Tennessee (13–10, 5–5) as one of the Last Four In our field of 68 in this week’s Bracket Watch, which puts us on a bit of an island. The Volunteers made significant gains two weeks ago with wins over Kentucky and Kansas State, but a loss last weekend to Mississippi State canceled out some of that good will. We gave them the final spot in the field, however, thanks to those wins, as well as a kenpom.com rating of 36 and an RPI ranking of 35. The belief here is that, if Selection Sunday were last weekend, the Volunteers strength in the ratings systems, as well as their documented proof of being able to beat high-level tournament competition would have put them into the field. Still, their position is as precarious as it gets. The Volunteers play host to Mississippi and Georgia (13–10, 4–6) this week. Speaking of the Bulldogs, they came up just short in what could have been a week that made their season. It started with an overtime loss at Kentucky in which they rallied from an eight-point deficit with just more than six minutes remaining in the game, taking their first lead of the second half with less than two minutes. Unfortunately for the Bulldogs, Malik Monk forced overtime by hitting a seemingly impossible jumper with five seconds left. It was academic from there, with Kentucky dominating the extra period. Georgia rebounded nicely from that heartbreak, taking South Carolina down to the wire in Columbia. The Bulldogs came up just short in that one, too, losing 77-75. If the Bulldogs had won either of those games, they could have been one of the last teams in our field. If they won both, they likely would have vaulted the Last Four In, landing as a No. 10 or 11 seed. Instead, they’re running ninth among teams that are on the outside looking in, just behind Rhode Island and Georgetown. They don’t have any time to feel sorry for themselves, though, with Florida visiting on Tuesday before a trip to Knoxville to play the Volunteers on Saturday. The rest of the conference is far from the tournament field. In last week’s Bubble Watch, we discussed how Alabama (13–9, 6–4) was the one second-tier team in the SEC seemingly above the fray, going 6–1 against teams not named Kentucky, South Carolina and Florida. Make that 6-3 after losses to Arkansas and Auburn last week. With Kentucky and South Carolina on the schedule this week, the Crimson Tide could be just a win over .500 in league play at this point next week. It’s safe to say at this point that the SEC isn’t getting more than five bids. Kentucky, Florida and South Carolina are locked in. Arkansas has the next best shot, with Tennessee and Georgia behind the Razorbacks. It’ll take a minor miracle for any other SEC team to be hopeful on Selection Sunday. Saint Mary’s (21–2, 11–1 WCC) had another clean week, knocking off Pacific and San Diego, the latter by a ridiculous 71–27 score. The Gaels are ranked 14th on kenpom.com and 20th in the RPI, and should approach 30 wins, including the WCC tournament. They get their return matchup with Gonzaga at home on Saturday, and a win there would remove whatever tiny doubt there might be surrounding the Gaels’ at-large candidacy. Win or lose, though, the bet here is that the Gaels will be safe on Selection Sunday. Wichita State (21–4, 11–1 MVC) exacted revenge on Illinois State (19–5, 11–1 MVC) last weekend, dominating the Redbirds, 86–45, to even the season series the race for first place in the MVC. Let’s assume that both teams win out, which seems a safer bet for the Shockers, but likely enough for both teams. If they then both move on to the MVC tournament championship, will the loser of that game be in good shape on Selection Sunday? That will depend heavily on what power conference bubble teams do the rest of the season, but neither of these teams makes an incredibly compelling at-large case. The Shockers are ranked 17th on kenpom.com and don’t have any bad losses, but their best nonconference win of the season was over Oklahoma, and the victory against Illinois State will go down as their only one against a top-50 RPI team. On top of that, they’re 57th in the RPI and—no matter what you think of the predictive power of the metric—it’s going to work against the Shockers. Illinois State, meanwhile, has to hope the committee will look past losses to Murray State, Tulsa and San Francisco. The Redbirds are 34th in the RPI, but just 2–2 against the top 100, without a win against a top-50 RPI team. Are either of those more compelling cases than Georgia Tech’s, built on the strength of wins over North Carolina, Notre Dame and Florida State? Or what about Clemson, which will likely be on the bubble with at least 10 top-100 wins? We believe this will be a one-bid league this season, no matter who wins the conference tournament. Middle Tennessee (20–4, 10–1) likely the only other small conference team harboring even semi-realistic at-large hopes, but those are gone after their loss at UTEP, a team ranked 253rd on kenpom.com and 297th in the RPI, last weekend. From this point forward, we’ll only be looking at Saint Mary’s, Wichita State and Illinois State in this section. That’s great news for power conference bubble teams across the country. No matter what happens in the small conference tournaments this season, there will not be many, if any, bid thieves.